The boys' new 2001 Okama GameSphere is stolen by mysterious operatives seeking an intelligent towel that's wandering around South Park, asking people if they want to get high. The boys are told that if they want their game back they should bring the towel (called Towelie) to a gas station outside town. A gunfight breaks out and the boys and the towel escape in a military truck. It turns out there are two factions battling for the towel -- a group of space aliens masquerading as executives for a company called Tynacorp, and a group of disaffected former Tynacorp employees masquerading as a unit of the U.S. Army. None of them matter to the kids, they just want their GameSphere back. 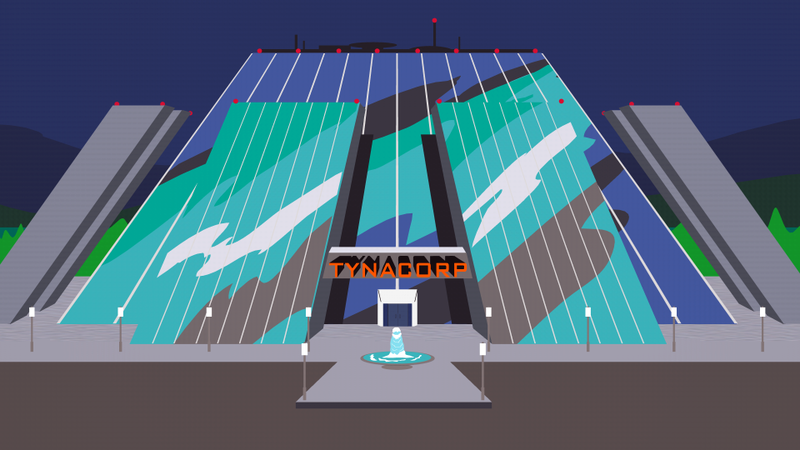 A huge battle at Tynacorp headquarters ensues. The building blows up, leaving the boys suspended over a vat of acid, hanging onto Towelie for dear life. A more advanced Evil Towel (called the GS-401) offers Towelie a joint if he'll drop the kids. Making a supreme effort, Towelie manages to take a hit off the joint, then hoist the kids to safety. The Evil Towel falls into the acid and disintegrates. The boys recover their GameSphere and take it home to play, while Towelie gets monumentallyhigh. "You are the worst character ever, Towelie." Towelie (aka Smart Towel RG400), an absorbent, stoner towel that befriends the boys. Also, his rival, the Evil Towel (aka the GS-401). We are also introduced to Commander Thomas on the military side, and the head Tynacorp scientist, Zytar, who turns out to be an alien in a wheelchair. Countless military personnel, Tynacorp henchman, and scientists are killed in the bloody battle to recapture Towelie. Even Commander Thomas and Tynacorp's head scientist/alien, Zytar, are killed in the final showdown. Kenny and the Evil Towel are both incinerated when they fall into the vat of acid. And every towel within a 100-mile radius of South Park is shot to pieces. - In 2011, fans voted "Towelie" to be their #11 favorite episode of all time. - Towelie is voiced by Vernon Chatman, a longtime South Park producer. It’s one of the few characters not done by Matt/Trey. - The Evil Towel (aka the GS 401) doesn't actually have a name in the episode, but in the script - and to people who worked on the show -- he his called Gary the Evil Towel. - "You shouldn't a done 'nat! He just a boy!" This Cartman line is a reference to the 90's flick “Sling Blade”. - "Funkytown" is a classic disco song by the band Lipps Inc...although we prefer Towelie's keypad rendition. - The scene with the deformed towel saying "kill me…" parodies a similar scene from "Alien Resurrection". - Similarly, the final scene with the boys hanging from a catwalk, above the core of molten lava, parodies a scene from "Aliens 3". - That little melody that plays every time Towelie gets high is an homage to the Popeye theme. It's pretty much Towelie's spinach. Yep, that's the offical cover page to "Towelie" script from our archives. It was written and directed by Trey. Check out this script excerpt from the infamous "car scene" with Towelie and the boys. The Gamesphere has made a ton of cameos in the background of other episodes, including "Make Love, Not Warcraft". The Okama Gamesphere is a reference to the Nintendo Gamecube. The word “okama” means “gay” in Japanese. This is old-school production art used while creating and tweaking the deformed "Pretowelies". Where did the idea for the “Towelie” commercial come from? According to Matt and Trey: That’s the joke. We made a character. We’re immediately gonna put it on a t-shirt, we’re immediately gonna try to sell you it. Even though it’s the worst character of all time. Did you catch the alien hidden on the test tube towel behind the Commander? The evil towel isn’t named here, but in the script (and to the crew who worked on the show) he's called Gary the Evil Towel. At the time we made this show, this long shot took forever to do. It was back at the time when we couldn’t do long shots because we just didn’t have the computer processing power. This shot took hours and hours and HOURS to render, and multiple versions from four animators were stitched together to produce this one long fight scene. At the time, this shot was a really big deal. - The original idea was to make fun of creating a character that's totally worthless and stupid. Of course, that would be a towel. - According to Matt and Trey: "Towelie" was an end-of the run kind of idea, where it was just SO ridiculous. The writers made a conscious effort to create a character nobody would care about. And of course, people wound up loving him.. The scene in which Towelie encounters failed, cloned versions of himself was taken from a similar moment in the movie Alien Resurrection. There's also an alien hidden in one of the test tube towels behind Commander Thomas. Furthermore, the scene with the boys hanging onto the catwalk over a vat of molten lava is borrowed from Aliens 3. When Commander Thomas and his army forces are searching for the missing Towel, one of the marines suggests that maybe the boys are "telepathically linked to the towel. Like E.T." While trying to remember the code to the security system, Towlie gets high and plays the famous disco jam "Funkytown" on the key pad. Throughout the episode, the Popeye theme plays when Towelie takes a hit off a joint, just as it did when Popeye ate spinach. Even though Cartman and the boys bought tampons and got their "periods" in "Are You There God? It's Me Jesus", they still have no idea what a period actually is. We see a live action commercial for Towelie products in this episode. "I Love Towelie" and "I Hate Towelie" t-shirts, as well as a Towelie Towel complete with push-button catchphrases. Not since the debut of Mr. Hankey in "Mr. Hankey the Christmas Poo" have we seen a new character get such immediate product placement. The boys are pretty daring in this episode: Stan drives the car, with Kenny operating the gas and brake. Also, all four boys (and Towlie) jump out of a plane and parachute onto a military base. The Okama GameSphere is a reference to the Nintendo Gamecube. The word "okama" means "gay" in Japanese.